Child mortality is the death of a child before the child's fifth birthday, measured as the Under-5 Child Mortality Rate (U5MR). 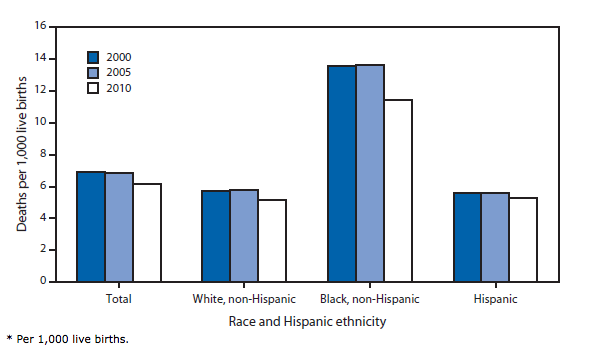 National statistics sometimes group these two mortality rates together. Globally, ten million infants and children die each year before their fifth birthday; 99% of these deaths occur in developing nations. Infant mortality rate (IMR) is the number of deaths of children less than one year of age per 1000 live births. The rate for a given region is the number of children dying under one year of age, divided by the number of live births during the year, multiplied by 1,000. Postneonatal mortality is the death of children aged 29 days to one year. The major contributors to postneonatal death are malnutrition, infectious disease, and problems with the home environment. Leading causes of congenital infant mortality are malformations, sudden infant death syndrome, maternal complications during pregnancy, and accidents and unintentional injuries. Environmental and social barriers prevent access to basic medical resources and thus contribute to an increasing infant mortality rate; 99% of infant deaths occur in developing countries, and 86% of these deaths are due to infections, premature births, complications during delivery, and perinatal asphyxia and birth injuries. Greatest percentage reduction of infant mortality occurs in countries that already have low rates of infant mortality. Common causes are preventable with low-cost measures. In the United States, a primary determinant of infant mortality risk is infant birth weight with lower birth weights increasing the risk of infant mortality. The determinants of low birth weight include socio-economic, psychological, behavioral and environmental factors. Causes of infant mortality that are related to medical conditions include: low birth weight, sudden infant death syndrome, malnutrition and infectious diseases, including neglected tropical diseases. Thousands of infant deaths per year are classified as Sudden infant death syndrome (SIDS). According to the Mayo Clinic, SIDS is the unexplained death, usually during sleep, of a seemingly healthy baby. Although the direct cause of SIDS remains unknown, many doctors believe that there are several factors that put babies at an increased risk of SIDS, including: babies sleeping on their stomachs, exposure to cigarette smoke in the womb or after birth, sleeping in bed with parents, premature birth, being a twin or triplet, being born to a teen mother, and also living in poverty settings. Although the cause is unknown and currently cannot be explained, doctors have come to the conclusion that SIDS is most likely to occur between 2 and 4 months and most deaths occur in the winter time. Recommended precautions include ensuring that infants sleep on their backs, controlling the temperature of the bedroom, employing a crib without toys or excess bedding, and breastfeeding. Malnutrition frequently accompanies these diseases, and is a primary factor contributing to the complications of both diarrhea and pneumonia, although the causal links and mechanisms remain unclear. Factors other nutrition also influence the incidence of diarrhea, including socioeconomic status, disruption of traditional lifestyles, access to clean water and sanitation facilities, age and breastfeeding status. Protein energy malnutrition and micronutrient deficiency are two reasons for stunted growth in children under five years old in the least developed countries. Malnutrition leads to diarrhea and dehydration, and ultimately death. Millions of women in developing countries are stunted due to a history of childhood malnutrition. Women's bodies are thus underdeveloped, and their chances of surviving childbirth decrease. Due to underdeveloped bodies, the probability of an obstructed pregnancy increases. Protein-energy deficiency results in low-quality breastmilk that provides less energy and other nutrition. Vitamin A deficiency can lead to stunted growth, blindness, and increased mortality due to the lack of nutrients in the body. 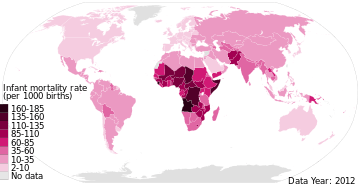 Two hundred and fifty million infants are affected by Vitamin A deficiency. Among women in developing countries, 40% have iron deficiency anemia, which increases maternal and infant mortality rates, chances of stillbirth, cases of low birth weight babies, premature delivery, and probability of fetal brain damage. One way to prevent Vitamin A deficiency is to educate the mother on the many benefits of breastfeeding. Breastmilk is a natural source of Vitamin A, and supplies the suckling infant with enough Vitamin A. In most cases, war-affected areas will experience a significant increase in infant mortality rates. Having a war taking place where a woman is planning on having a baby is not only stressful on the mother and fetus, but also has several detrimental effects. Another cultural reason for infant mortality, such as what is happening in Ghana, is that "besides the obvious, like rutted roads, there are prejudices against wives or newborns leaving the house." Because of this it is making it even more difficult for the women and newborns to get the treatment that is available to them and that is needed. The mother's educational attainment and literacy are correlated with age of first pregnancy, and probability that the mother attain prenatal and postnatal care. Mothers with a secondary education have a higher probability of waiting until a later age to get pregnant. Once pregnant, they are also more likely to get prenatal and postnatal care, and deliver their child in the presence of a skilled attendant. Women who finish at least a primary-level education have improved nutrition, medical care, information access, and economic independence. Infants reap benefits such as healthy environments, improved nutrition, and medical care. Mothers with some level of education have a higher probability to breastfeeding. The duration of breastfeeding has the potential to influence the birth space. Women without any educational background tend to have children at an earlier age, thus their bodies are not yet mature enough to carry and deliver a child. Millennium Development Goals were created to improve the health and well being of people worldwide. Its fourth goal is to decrease the number of mortalities within the infant and childhood population by two thirds, a decrease from 95 to 31 deaths per 1000. Countries slow to abide by the Millennium Development Goal by 2015 are projected to have difficulty in reaching goal four. Technological advances in medicine would decrease the infant mortality rate and an increased access to such technologies could decrease racial and ethnic disparities. It has been shown that technological determinants are influenced by social determinants. Those who cannot afford to utilize advances in medicine tend to show higher rates of infant mortality. Technological advances has, in a way, contributed to the social disparities observed today. Providing equal access has the potential to decrease socioeconomic disparities in infant mortality. Specifically, Cambodia is facing issues with a disease that is unfortunately killing infants. The symptoms only last 24 hours and the result is death. As stated if technological advances were increased in countries it would make it easier to find the solution to diseases such as this. Educated females practice a healthier lifestyle. The more educated a woman is the more likely she is to seek out care, give birth in the presence of a skilled attendant, breastfeed, and understand the consequences of HIV/AIDS. Improving women's health and social status is one way to ameliorate infant mortality. Status should rise for females seeking out education. Providing women access to family planning centers can educate mothers on how to plan ahead for their families. Educational means can also teach mothers on the beneficial health practices such as breastfeeding. Government recognizing birth space as a possible health intervention is now working towards making affordable contraception available. In certain parts of the U.S., specific modern programs aim to reduce levels of infant mortality. An example of one such program is the 'Healthy Me, Healthy You' program based in Northeast Texas. It intends to identify factors that contribute to negative birth outcomes throughout a 37-county area. The exclusion of any high-risk infants from the denominator or numerator in reported IMRs can casue problems in making comparisons. Many countries, including the United States, Sweden and Germany, count an infant exhibiting any sign of life as alive, no matter the month of gestation or the size, but according to United States some other countries differ in these practices. All of the countries named adopted the WHO definitions in the late 1980s or early 1990s, which are used throughout the European Union. However, in 2009, the US CDC issued a report that stated that the American rates of infant mortality were affected by the United States' high rates of premature babies compared to European countries. 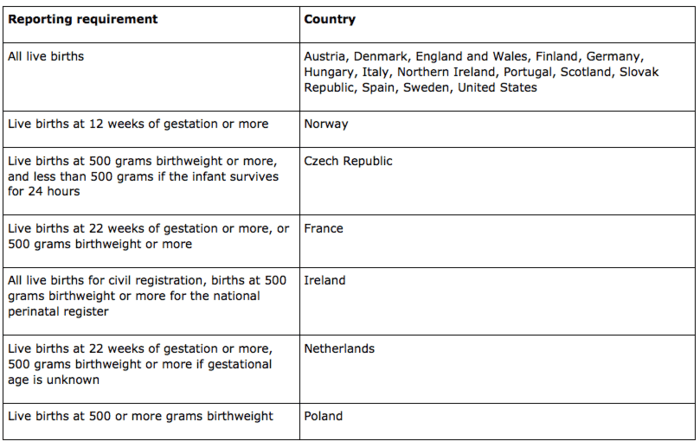 It also outlined the differences in reporting requirements between the United States and Europe, noting that France, the Czech Republic, Ireland, the Netherlands, and Poland do not report all live births of babies under 500 g and/or 22 weeks of gestation. However, the differences in reporting are unlikely to be the primary explanation for the United States' relatively low international ranking. Rather, the report concluded that primary reason for the United States’ higher infant mortality rate when compared with Europe was the United States’ much higher percentage of preterm births. There are a number of factors which may account for this higher rate of preterm births, which include obesity or poor prenatal care. Regional differences in the reporting of life births. In reliability engineering, "infant mortality" refers to the failures that occur in the first part of the bathtub curve. 1 2 3 4 5 6 7 8 9 10 11 12 13 14 15 16 17 18 19 20 Andrews, K.M. ; Brouillette, D.B; Brouillette, R.T. (2008). "Mortality, Infant". Encyclopedia of Infant and Early Childhood Development. Elsevier. pp. 343–359. doi:10.1016/B978-012370877-9.00084-0. 1 2 3 4 5 Norton M (2005). "New evidence on birth spacing: promising findings for improving newborn, infant, child, and maternal health". Int J Gynaecol Obstet. 89 Suppl 1: S1–S6. doi:10.1016/j.ijgo.2004.12.012. PMID 15820364. 1 2 3 Bishai D (2007). "Does the level of infant mortality affect the rate of decline? Time series data from 21 countries". Econ Hum Biol. 5 (1): 74–81. doi:10.1016/j.ehb.2006.10.003. PMID 17141591. 1 2 3 4 5 6 Osel, J. D. (2008). "Being (Born) Black in America: Perceived Discrimination & African-American Infant Mortality". SSRN Electronic Journal. doi:10.2139/ssrn.2173553. 1 2 3 4 5 MacDorman MF (2009). "The challenge of infant mortality: have we reached a plateau?". Public Health Rep. 124 (5): 670–681. PMC 2728659 . PMID 19753945. ↑ Santosham, Mathuram; Chan, Grace J.; Lee, Anne CC; Baqui, Abdullah H.; Tan, Jingwen; Black, Robert E. (2013). "Risk of Early-Onset Neonatal Infection with Maternal Infection or Colonization: A Global Systematic Review and Meta-Analysis". PLoS Medicine. 10 (8): e1001502. doi:10.1371/journal.pmed.1001502. ISSN 1549-1676. PMC 3747995 . PMID 23976885. 1 2 Nussbaum, Martha (2011). Creating Capabilities. The Belknap Press of Harvard University Press. ISBN 0-674-05054-1. 1 2 3 4 5 6 Gortmaker SL (1997). "The first injustice: socioeconomic disparities, health services technology, and infant mortality". Annu Rev Sociol. 23: 147–170. doi:10.1146/annurev.soc.23.1.147. PMID 12348279. 1 2 3 4 5 6 7 Jorgenson, A. K. (2004). "Global inequality, water pollution, and infant mortality". The Social Science Journal. 41 (2): 279–288. doi:10.1016/j.soscij.2004.01.008. ↑ Woodruff TJ (2008). "Air pollution and postneonatal infant mortality in the United States, 1999-2002". Environ. Health Perspect. 116 (1): 110–115. doi:10.1289/ehp.10370. PMC 2199284 . PMID 18197308. ↑ Glinianaia SV (2004). "Does particulate air pollution contribute to infant death? A systematic review". Environ. Health Perspect. 112 (14): 1365–71. doi:10.1289/ehp.6857. PMC 1247561 . PMID 15471726. ↑ Benjamin, D.K, (2006). Air Pollution and Infant Mortality. Property and Environmental Research Center Report. 24 (4). ↑ Haines, Michael R. (June 2010) Inequality and Infant and Childhood Mortality in the United States in the Twentieth Century. NBER Working Paper No. 16133. 1 2 3 4 5 Farahani M (2009). "The effect of changes in health sector resources on infant mortality in the short-run and the long-run: a longitudinal econometric analysis". Soc Sci Med. 68 (11): 1918–1925. doi:10.1016/j.socscimed.2009.03.023. PMID 19362762. 1 2 Krug, Etienne (2002). World Report on Violence and Health. Geneva: Geneva WHO. ↑ Toole, M. J.; Galson, S.; Brady, W. (1993). "Are war and public health compatible?". The Lancet. 341 (8854): 1193–6. doi:10.1016/0140-6736(93)91013-C. PMID 8098086. ↑ Asling-Monemi K (2003). "Violence against women increases the risk of infant and child mortality: a case-referent study in Nicaragua". Bull. World Health Organ. 81 (1): 10–16. PMC 2572309 . PMID 12640470. ↑ Emenike E (2008). "Intimate partner violence and reproductive health of women in Kenya". Int Nurs Rev. 55 (1): 97–102. doi:10.1111/j.1466-7657.2007.00580.x. PMID 18275542. ↑ Jejeebhoy SJ (1998). "Associations between wife-beating and fetal and infant death: impressions from a survey in rural India". Stud Fam Plann. 29 (3): 300–308. doi:10.2307/172276. JSTOR 172276. PMID 9789323. ↑ Fisher, Siobhán K. (October 1996). "Occupation of the Womb: Forced Impregnation as Genocide". Duke Law Journal. 46 (1): 91–133. doi:10.2307/1372967. JSTOR 1372967. 1 2 3 4 5 Shandra JM (2004). "Dependency, democracy, and infant mortality: a quantitative, cross-national analysis of less developed countries". Soc Sci Med. 59 (2): 321–333. doi:10.1016/j.socscimed.2003.10.022. PMID 15110423. ↑ Stratton, Kathleen; Almario, Donna A.; Wizemann, Theresa M. and McCormick, Marie C. (2003) Immunization Safety Review: Vaccinations and Sudden Unexpected Death in Infancy. Institute of Medicine, Immunization Safety Review Committee, Board of Health Promotion and Disease Prevention. 1 2 3 4 5 6 Fuse K (2006). "Gender imbalance in infant mortality: a cross-national study of social structure and female infanticide". Soc Sci Med. 62 (2): 360–374. doi:10.1016/j.socscimed.2005.06.006. PMID 16046041. ↑ Moore S (2006). "The health of nations in a global context: trade, global stratification, and infant mortality rates". Soc Sci Med. 63 (1): 165–178. doi:10.1016/j.socscimed.2005.12.009. PMID 16457924. 1 2 3 4 5 6 7 8 9 10 11 12 13 14 Nations, M. K.; Amaral, M. L. (1991). "Flesh, Blood, Souls, and Households: Cultural Validity in Mortality Inquiry". Medical Anthropology Quarterly. 5 (3): 204–220. doi:10.1525/maq.1991.5.3.02a00020. 1 2 Drevenstedt GL (2008). "The rise and fall of excess male infant mortality". Proc. Natl. Acad. Sci. U.S.A. 105 (13): 5016–21. Bibcode:2008PNAS..105.5016D. doi:10.1073/pnas.0800221105. PMID 18362357. 1 2 3 4 Rutstein SO (2005). "Effects of preceding birth intervals on neonatal, infant and under-five years mortality and nutritional status in developing countries: evidence from the demographic and health surveys". Int J Gynaecol Obstet. 89 Suppl 1: S7–24. doi:10.1016/j.ijgo.2004.11.012. PMID 15820369. ↑ Dillard, Coshandra (August 21, 2016). "Surviving, thriving:Public health workers working to improve East Texas babies' health, reduce infant mortality". Tyler Morning Telegraph. Tyler, Texas. pp. A1. ↑ King, Gary; Zeng, Langche (July 2001). "Improving forecasts of state failure". World Politics (PDF)|format= requires |url= (help). 53 (4): 623–658. doi:10.1353/wp.2001.0018. ↑ Anthopolos, R.; Becker, C. M. (2010). "Global Infant Mortality: Correcting for Undercounting". World Development. 38 (4): 467–481. doi:10.1016/j.worlddev.2009.11.013. ↑ Healy, Bernadine (2006-09-24). "Behind the Baby Count". US News & World Report. Archived from the original on August 24, 2007. Retrieved 2014-03-24. ↑ Demographic Statistics: Definitions and Methods of Collection in 31 European Countries (by European Communities, 2003). (PDF). Retrieved 2013-09-29. ↑ Coale AJ (1994). "Five decades of missing females in China". Demography. 31 (3): 459–479. doi:10.2307/2061752. PMID 7828766. ↑ Brown, David (2011-02-28) Child mortality falls more than 40 percent in the past two decades. The Washington Post. ↑ Duc G (1995). "The crucial role of definition in perinatal epidemiology". Soz Praventivmed. 40 (6): 357–360. doi:10.1007/BF01325417. PMID 8578873. ↑ Definition of data collected in the European Union, see item 8. Europa (web portal). ↑ Hendrick, Bill (2009-11-04). "Preemies Raise U.S. Infant Mortality Rate". WebMD. Retrieved 2009-11-04. ↑ Stobbe, Mike (2009-11-03). "Premature births worsen US infant death rate". Associated Press. ↑ "Behind International Rankings of Infant Mortality: How the United States Compares with Europe". Centers for Disease Control. November 2009. Archived from the original on 2011-08-22. Retrieved 2009-11-04. ↑ "Behind International Rankings of Infant Mortality: How the United States Compares with Europe". Centers for Disease Control. November 2009. Retrieved 2009-11-05. ↑ NICHD – The Eunice Kennedy Shriver National Institute of Child Health and Human Development Official Home Page. Nichd.nih.gov. Retrieved 2013-09-29. ↑ Anderson, Barbara A.; Silver, Brian D. (December 1986). "Infant Mortality in the Soviet Union: regional differences and measurement issues". Population and Development Review. 12 (4): 705–737. doi:10.2307/1973432. JSTOR 1973432. ↑ Blum, Alain (1987). "Une nouvelle table de mortalité pour l'URSS (1984-1985)". Population (French Edition). 6 (6): 843–862. doi:10.2307/1532733. JSTOR 1532733. ↑ Ksenofontova, N. Yu. (1994). 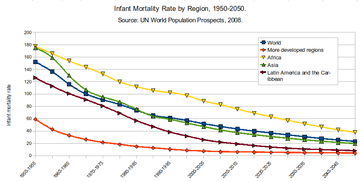 "Trends in infant mortality in the USSR". In W. Lutz; S. Scherbov; A. Volkov. Demographic Trends and Patterns in the Soviet Union before 1991. London: Routledge. pp. 359–378. ISBN 0-415-10194-8. ↑ Farmer PE (2006). "Structural violence and clinical medicine". PLoS Med. 3 (10): e449. doi:10.1371/journal.pmed.0030449. PMC 1621099 . PMID 17076568. ↑ "CIA – The World Factbook: Infant Mortality Rate". Archived from the original on December 18, 2012. Retrieved December 18, 2012. ↑ Guillot M (2012). Byass, Peter, ed. "Child mortality estimation: a global overview of infant and child mortality age patterns in light of new empirical data". PLoS Med. 9 (8): e1001299. doi:10.1371/journal.pmed.1001299. PMC 3429403 . PMID 22952438. ↑ Martin, J. A. (June 28, 2013). "Births: Final Data for 2011" (PDF). National Vital Statistics Reports. 62 (1). ↑ 12Societal Costs of Preterm Birth in Preterm Birth: Causes, Consequences, and Prevention. Institute of Medicine (US) Committee on Understanding Premature Birth and Assuring Healthy Outcomes; Behrman RE, Butler AS (eds.). Washington (DC): National Academies Press (US); 2007. ↑ Oestergaard MZ (2011). "Neonatal mortality levels for 193 countries in 2009 with trends since 1990: a systematic analysis of progress, projections, and priorities". PLoS Med. 8 (8): e1001080. doi:10.1371/journal.pmed.1001080. PMC 3168874 . PMID 21918640. ↑ Starfield B (2000). "Is US health really the best in the world?" (PDF). JAMA. 284 (4): 483–485. doi:10.1001/jama.284.4.483. PMID 10904513. ↑ Partridge JC (2012). "Resuscitation of likely nonviable infants: a cost-utility analysis after the Born-Alive Infant Protection Act". Am. J. Obstet. Gynecol. 206 (1): 49.e1–49.e10. doi:10.1016/j.ajog.2011.09.026. PMID 22051817. ↑ Dole N (2004). "Psychosocial factors and preterm birth among African American and White women in central North Carolina". Am J Public Health. 94 (8): 1358–1365. doi:10.2105/AJPH.94.8.1358. PMC 1448456 . PMID 15284044. ↑ Mustillo S (2004). "Self-reported experiences of racial discrimination and Black-White differences in preterm and low-birthweight deliveries: the CARDIA Study". Am J Public Health. 94 (12): 2125–2131. doi:10.2105/AJPH.94.12.2125. PMC 1448602 . PMID 15569964. 1 2 "1892 Millions of Lives Saved by Pasteurized Milk | Economic & Social Prosperity | The Philanthropy Roundtable". Retrieved 27 October 2016.